Today, along the Californian coast, South of Monterey Bay is a place called Carmel-by-the-Sea. Under blue sky and white crashing waves you can still hear the wonderful sounds of seagulls, and sometimes a playful otter. If you were to take a time machine back only five hundred, or twenty thousand years ago, you would also hear the playing sounds of children on the beach, just as there are today in the Year 2001. It is said in our traditions that we have always been here in California and current archaeological evidence confirms that our Grandmothers and Grandfathers have been in California for at least 20,000 years. We were not alone, for we had neighbors. These neighbors were in other tribes located in villages and camps on the coast and in the canyons. We would trade with them, maybe meet a new husband or wife, and rarely, but ocassionally had our disagreements. Life along the coast provided all we needed. Then, in the year 1492, something would happen very far from Carmel California, that would effect all the Native American way of life forever... and that was the landing of Christopher Columbus, representing the nation of Spain. Although world events were in progress that would effect the future of the Costanoan Rumsen Carmel people, one particular day would have the most dramatic change. That day was June 3, 1770. The Spanish "Father Serra" arrived by sea from the new mission he created in San Diego. He met a Spanish military expedition led by the Spanish Governor Gaspar de Portola. Immediately, the Governor created a fort, known in Spanish as a "presidio" and Father Serra with the help of our relatives built a small church at the presidio. Times were hard, and when a resupply ship never showed up, our relatives helped the Spanish people. Even with this help, the Spanish military personnel made life very difficult for us and there were often incidents. Father Serra decided to move the church to the other side of Monterey. One year later, permission was given by Spain for Father Serra to move the church and California's second mission was to be built in what is now called Carmel. During this time, many good things, and many bad things happened to our people. Life under Spanish rule was harsh because unless our Grandparents converted to Catholisim, they were not treated as equals. Spain had just defeated the muslims in their homecountry, and declared to bring Christianity to all of the "New World". It is easy to talk about the bad things that happened, and many people today are still very angry over how our people were treated. Many of our tribal members are Catholic to this very day, while others hold and maintain our traditional beliefs. Some of our members mix their beliefs of both and they are free in our society to do so as the tribe encourages all to take their own spiritual journey. Many members still enjoy a relationship with the original mission. Our neighbors from other tribes and villages were gathered at the mission, some came voluntarily, but some came only by force in which the Spanish Military provided. It was the Spanish Catholic way to "save the souls" of the Native American people. Those that learned the ways of the church were called "neophytes". The Spanish called us "Costanoan" which means "coast people." We call ourselves "Ohlone" in our language. Rumsen is the name of five villages in the area of Monterey and Carmel where the Spanish landed. Thus, we are the Costanoan-Rumsen-Carmel People (and thus "Tribe"). Reading the history, you will see how many of the geographic locations in California where named for the people from those times. Below, you will see a detailed timeline of world events and how our homeland of Monterey and the Carmel area played an important role in the History of California and the United States. Our history is tied to the land and to the people that have come to our shores. In the past, there have been many dark times, and our Grandmothers and Grandfathers had to endure much, but now we enjoy a period of peace and co-existence. Our culture continues to this day, and we hope that the history of our people will never be forgotten. 1492 - Far from California, the Spanish explorer Columbus lands in the Caribbean islands. Columbus brought America to the attention of the civilized world, and to the growing scientific civilizations of Western Europe. 1513 - Vasco Nunez de Balboa reaches the Pacific by sea. 1519 - The conquistador Hernando Cortes subdued the Aztecs empire in Mexico with an alliance of "rebel" Indians and 500 Spaniards armed with swords, guns, and horses. 1522 - Survivors of Ferdinand Magellan's expedition completed the first circumnavigation of the globe by sea. 1531 - 1533 Francisco Pizzaro overthrew the empire of the Incas and established Spanish dominion over Peru. 1542 - Juan Rodriguez Cabrillo is sent on a Spanish naval expedition up the California coastline. He sails into San Diego harbor, becoming the first European to enter California and claims the new-found land for Spain. Cabrillo goes on to chart the harbors at San Pedro and Santa Barbara. His expedition spends the winter on Santa Catalina Island, where Cabrillo dies. 1543 - The Cabrillo expedition continues under the command of chief pilot Bartoleme Ferrer, who discovers San Francisco Bay and pushes on to the Rouge River, north of the present border between California and Oregon, before turning back. 1579 - Sir Francis Drake sails into a small harbor north of San Francisco Bay to repair his ship, "The Golden Hind", after a year of marauding along the Mexican coast; he claims the surrounding territory for Queen Elizabeth I and England. 1602 - With three ships, "San Diego", "Santo Tomás", and "Tres Reyes", Spanish sailor Sebastian Vizcaino discovers Monterey Bay and describes the location as the "land of milk and honey". Vizcaino also describes the Monterey/Carmel area as the best port that could be desired, sheltered from all winds; with much wood and water; settlements of friendly Indians; springs of good water; beautiful lakes covered with ducks and many other birds; good meadows for cattle; fertile fields for growing crops. Vizcaino names the area after the viceroy of Mexico, Don Gaspár de Zúñiga y Acevedo, Count of Monte Rey, who chartered the expedition. Most of the sailers were suffering from scurvy; many were seriously ill, and 16 had died. 1705 - Eusebio Kino produces a map which finally establishes that California is part of North America, not a giant island. 1713 - Miguel Joseph "Junipero" Serra was born November 24, at Petra Majorca in Spain's Balearic Isles. As an adult, he would become Father Serra and create a chain of 21 missions in California. 1741 - Russians Vitus Bering and Alexi Chirikov explore the coast of Alaska. 1769 - Settlement of California by Spanish Forces. 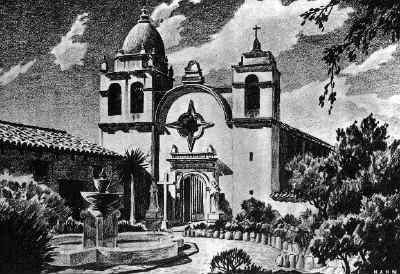 Father Junipero Serra, a Franciscan accompanying a Mexican expeditionary force under the command of Gaspar de Portola, establishes Mission San Diego de Alcala near the site of present-day San Diego. The outpost is the first in a planned string of settlements along the coast of Spain's California territory which are intended to guard against Russian intruders. 1770 - On the first day of June, the Spanish packet ship "San Antonio" put into the pine-bordered harbor of Monterey. It had been over a month in covering the more than 400 miles from San Diego. Once ashore, the passengers, with Father Junípero Serra at their head, were surrounded by the men of Governor Portolá's land expedition. The latter group, which left San Diego by land, after the sailing of the San Antonio, had arrived more than a week before. After the joyous religious ceremony which accompanied the raising of the Spanish flag, news of the occupation was immediately dispatched overland to the Spanish authorities in Mexico. Within a few weeks, a church was erected, and the military presidio settled into a business-like routine. The heavy stands of forest that surround the settlement made adequate housing easy to construct. Rough as it was, it presented an almost luxurious contrast to the mud and brush shelters in San Diego. Fr. Serra found the climate and surroundings of Monterey so much to his liking that it became his favorite mission and the headquarters of the mission chain. 1770 July - Portolá turned his command over to Lieutenant Fages, and departed. The new military commander was unlike the easy-going Portolá and immediately began to inject himself into mission affairs. Soon Fr. Serra decided that the mission was more likely to prosper at a distance from the presidio and in 1771 he moved it some five miles south to a verdant pasture bordering the Carmel River. The church at the Monterey Presidio continued in use for the soldiers of the garrison until 1794, when it was replaced by the structure which is still in use as a place of worship. 1775 - In San Diego, Indians forced to labor in the mission fields and to worship according to the missionaries' teachings, cause a rebellion against the Spanish, burning every building and killing most of the inhabitants, including the mission's head priest. A Spanish sharpshooter turns the battle and the Indians are driven off. The Spanish retain control of their outpost. 1776 - The Declaration of Independence marks the beginning of the American Revolutionary War and the creation of a new government known as the United States of America. 1776 - A group of 240 Spanish settlers, led overland from 2,200 miles in Mexico across desert and mountain by Governor Luis Anza, arrive in Monterey. Lieutenant Fages , and continue on to establish a permanent colony on San Francisco Bay. 1778 - The first treaty was signed between an Indian tribe, the Delaware, and the United States government. In signing this treaty, the United States was affirming the English and European tradition of dealing with tribes as political entities. Early U.S. policy was consistent with European practice of recognizing tribes as government with full internal sovereignty. 1787 - The United States Constitution is approved by the Constitutional Convention and ratified by the states the following year 1788. 1793 - A Spanish Military fortification known as "El Castillo" is built over one of our villages overlooking Monterey's harbor. Construction was finished in 1794. 1794 - The Royal Presidio Chapel (now called the San Carlos Cathedral) is built in Monterey. This is now the oldest building in Monterey. 1795 - The Treaty of San Lorenzo establishes the border between the United States and Spanish territories along the Mississippi and gives U.S. merchants the right to ship goods through New Orleans duty-free. 1803 - Napoleon has agreed to sell the Louisiana Territory to the United States for $15 million, although the transfer will violate the terms under which he had received the territory from Spain. United States Congress approves the deal in October. Jefferson no doubt foresaw, his proposed expedition will also serve to secure America's hold on its newest possession and to reinforce American claims in the Pacific northwest. 1804 - The Spanish divide California into Alta California and Baja California. Monterey becomes the capital of Alta California. 1806 - Spanish authorities in San Francisco reverse their policy and agree to sell provisions to Russian colonists after the Russians' representative becomes engaged to the daughter of the presidio's commander. 1809 - There are 25 Russian American colonies strung along the northern Pacific coast as far south as California. 1811 - Russian settlers found Fort Ross at Bodega Bay just north of San Francisco. 1818 - Hippolyte de Bouchard, a Frenchman commanding an Argentinean warship, lands and captures Monterey driving the Spanish soldiers inland. Bouchard ransacks Monterey and departs attacking several California ports down the coast. The Spanish soldiers retake Monterey. 1819 - The United States renounces all claims to Tejas (Texas) in a treaty with Spain that brings Florida under American control. 1820 - More than 20,000 Indians live in "virtual" slavery on the California missions. 1821 - Mexicans rebel against Spanish rule, winning independence. Monterey remains the capital of Alta California under Mexican authority. 1822 - President Monroe warns of armed reprisals if Russians attempt to establish a physical presence on lands claimed by the United States in the Pacific northwest. 1824 - The Bureau of Indian Affairs is established within the War Department, with a primary duty to regulate and settle disputes arising from trade with Indian tribes. 1824 - Russia agrees to set its southern border in the Pacific northwest at 54 degrees, 40 minutes, and to allow American vessels within the 100-mile limit it had set around its territories in the Pacific. 1826 - The rich and valuable lands held by the Spanish missions had long been a sore point among newly independent Mexican citizens who felt that all Alta California lands, not only the government sponsored pueblos and the few grazing tracts granted to a select group of favorites, should be opened up to settlement. Governor Echeandia issued decrees in 1826, 1830, and 1831 that weakened Indian dependence of the missions and set in motion the process of secularization of the 21 Alta California missions. Mexican Governor Figueroa in 1834 ordered the Franciscans to turn the missions over to secular priests, and the affairs of the mission to be handled by government officials. The result was predictable: the officials appropriated the missions and their extensive lands--lands held in trust for the Indians. The decree was supposed to make the Indians independent Mexican citizens, free of the padres, but when they were released they found themselves without any land. In spite of the decreed purpose to release mission Indians from conditions of near slavery and dependence and to open the land for settlement by petitioners, the immediate effects of secularization throughout California were to deprive a large percentage of the remaining mission Indians of their rightful property, and to disperse mission property quickly to Mexican land owners, frequently without regard for legal process, to a relatively few fortunately situated individuals. 1827 - In Monterey, the "Custom House" was built by the Mexican government for the collection of duties from foreign shipping. Since 1822, American ships from Boston would sail around the Cape to get hides and tallow. Money was virtually nonexistent in the frontier economy, as all obligations and transactions were carried out with the cattle hide, or "California bank note" as it was known to the traders. The rancheros manufactured almost nothing themselves, but slaughtered huge numbers of their herds in preparation for the periodical visits of the Boston trading ships. The hides were accepted as currency, valued in trade at two dollars apiece, while tallow was valued at six dollars per 100 pounds. This bought articles of every description from the trading ships: staple foods, clothing, fancy goods, furniture, or tools; at roughly a 300 percent markup over prices paid at Boston. The Custom House is the oldest U.S. Government building in California because the U.S. continued to use this facility after the war with Mexico. 1828 - The United States Senate ratifies a treaty setting the Sabine River as the border between Mexico and the United States. 1828 - Mexico decrees that all ships entering Alta California are to do so at Monterey in order to have their cargos inspected and taxes paid. California has many ports from the North and South and trade goods would be sold without paying taxes. 1831 - In Cherokee Nation v. State of Georgia, a dispute over Georgia's attempt to extend its jurisdiction over Cherokee territory, Chief Justice John Marshall denies Indians the right to court protection because they are not subject to the laws of the Constitution. He describes Indian tribes as "domestic dependent nations," saying that each is "a distinct political entity...capable of managing its own affairs." 1842 - Believing that the United States is at war with Mexico, Navy Commodore Thomas ap Catesby Jones, Commander of the American Pacific Squadron captures the capital Monterey and claims California for the United States. When he discovers this is a mistake, he apologizes and sails away. 1845 - Mexico severs relations with the United States after the U.S. annexation of Texas. This will have a direct effect upon the future of California. 1846 - Britain and the United States reach a compromise in the Pacific Northwest, setting the Oregon Territory's northern border at the 49th parallel. 1846 March - U.S. Army Col. John C. Fremont, on his third expedition through the West, raises the American flag at an improvised fort near Monterey. The United States is not at war with Mexico so he soon abandons his impetuous efforts and takes his forces North toward Oregon. On the way, however, he receives word of the impending Mexican War and returns to California. 1846 April - Mexican troops had crossed the Rio Grande on April 25 and attacked U.S. General Zachary Taylor's troops, killing or injuring 16 of them. In his war message, delivered to Congress on May 11-- U.S. President Polk claimed that Mexico had "invaded our territory and shed American blood on American soil.". Congress overwhelmingly approved a declaration of war on May 13. The United States sends its army on the Rio Grande, under General Taylor, to invade the heart of Mexico while a second force, under Colonel Stephen Kearny, was to occupy New Mexico and California. Kearny's campaign into New Mexico and California would meet with Capt Fremont and Commodore Stockton. 1846 May - Upon Capt. Fremont's arrival in California he defied Mexican authorities, throwing his support behind a small group of dissident Americans near Sonoma who started an unofficial uprising and created the Bear Flag Republic. When news of the declaration of war with Mexico reached California, Frémont was appointed by U.S. Navy Commodore Robert F. Stockton as major of a battalion and, with Stockton, moved their forces south to capture the entire state. Meanwhile, General Stephen Watts Kearny entered California from the southeast with orders to establish a government, leading to an obvious conflict of authority. Frémont accepted California's capitulation from Mexican officials at Cahuenga Pass, near Los Angeles, and Stockton appointed him military governor of California. Kearny, however, had Frémont arrested and court-martialed in Washington, D.C., in 1847-48 for disobedience. He was sentenced to dismissal from the army, and although his penalty was set aside by President James K. Polk, Frémont resigned. 1846 June - About a dozen Americans seized a large herd of horses from a Mexican military commandant. Another group of Americans captured Sonoma, the chief settlement north of San Francisco. Led by William B. Ide, the Americans issued a declaration of independence and hoisted a flag, its white ground emblazoned with a grizzly bear facing a red star. On June 25 U.S. Capt. John Charles Frémont arrived at Sonoma and gave his support to the Bear Flag Revolt. And on July 5 the insurrectionists elected Frémont the new President of the "Republic of California." 1846 July - Forces under U.S. Navy Commodore John D. Sloat lands in Monterey and moves to occupied San Francisco and Sonoma, claimed California for the United States, and replaced the bear flag with the American flag. Capt. Fremont was arrested and sent to Washington for court marshal. 1846 - Over the following months, American troops under Commodore Robert F. Stockton, aided by Fremont's so-called California Battalion, capture San Francisco, San Diego and Los Angeles without bloodshed. The Mexican Governor, Pio Pico, escapes to Mexico to avoid capture. Later Pico returns to Los Angeles and aids the Americans gain control of California. General Kearny, by order of Washington D.C. names Robert Stockton as the first American Governor of California. 1846 October - Los Angeles, the American occupation force stirs up violent resentment, and the Americans are driven out by a guerrilla force led by Anrés Pico, brother of the departed California governor Pio Pico. Stockton's first attempt to regain control of Los Angeles is repulsed, and while he regroups, an American force arrives from New Mexico, commanded by General Stephen Kearny. Attacked by Pico's insurgents at San Pascual, Kearny's troops suffer heavy losses, but with Stockton's aid they reach safety in San Diego. Early the next year 1847, Stockton, Kearny and Fremont combine forces to recapture Los Angeles, with Fremont accepting the insurgents' surrender in the Capitulation of Cahuenga on January 13. 1847 - Brigham Young assembles a "Mormon Battalion" of 500 volunteers to fight in the Mexican War, though by the time they reach California early in 1847, the conquest there is complete. 1847 - John C. Fremont is appointed governor of California by Commodore Stockton, but Fremont is soon arrested by General Kearny, who is under orders to act as governor of the province himself. Kearny ships Fremont back to Washington, where he is convicted of disobeying orders and dismissed from the Army. 1848 - End of the war with Mexico. The United States purchases California. The Treaty of Guadalupe Hidalgo, ending the Mexican War, was signed on February 2, 1848, by Nicholas P. Trist for the United States and by a special commission representing the collapsed government of Mexico. Trist disregarded a recall to Washington, and negotiated the treaty in violation of most of his instructions. The U.S. Senate reluctantly approved the treaty. Under the treaty, Mexico ceded to the United States Upper (Alta) California and New Mexico (including Arizona) and recognized U.S. claims over Texas, with the Rio Grande as its southern boundary. The United States in turn paid Mexico $15,000,000, assumed the claims of American citizens against Mexico, recognized prior land grants in the Southwest, and offered citizenship to any Mexicans residing in the area. Many Mexican officials become Americans and enter political offices. 1849 - The first public library in California is established in Monterey. 1849 September - Colton Hall in Monterey hosts The California State Constitutional Convention. Forty-eight delegates from ten districts in California debate for six weeks to create the state's first constitution. San Jose becomes the new capital of California. The constitution was written in both Spanish and English. 1850 - California enters the Union. With miners flooding the hillsides and devastating the land, California's Indians find themselves deprived of their traditional food sources and forced by hunger to raid the mining towns and other white settlements. Miners retaliate by hunting Indians down and brutally abusing them. The California legislature responds to the situation with an Indenture Act which establishes a form of legal slavery for the native peoples of the state by allowing whites to declare them vagrant and auction off their services for up to four months. The law also permits whites to indenture Indian children, with the permission of a parent or friend, and leads to widespread kidnapping of Indian children, who are then sold as "apprentices." 1853 - California begins confining its remaining Indian population on military reservations, but the combination of legal enslavement and near genocide has already made California the site of the worst slaughter of Native Americans in United States history. As many as 150,000 Indians lived in the state before 1849; by 1870, fewer than 30,000 will remain. 1861 - Confederate forces fire on Fort Sumter in Charleston, South Carolina, unleashing the Civil War. California declares for the Union when news of the Civil War reaches the far West more than a month after the attack on Fort Sumter. California remains a "Union" State. 1864 - A large group of the Costanoan Rumsen Carmel Tribal people leave the Carmel and head to the Prado-Chino area in Southern California. They remain intact as families and socio-political groups. 1865 The Confederate surrender at Appomattox Courthouse, Virginia, brings an end to the Civil War. The Union Pacific Railroad begins moving westward, laying track at an average rate of one mile per day. In California, Chinese laborers join the Central Pacific work gangs, providing the strength, organization and persistence needed to break through the mountains. 1867 - The United States purchases Alaska from Russia. 1881 - Helen Hunt Jackson publishes A Century of Dishonor, the first detailed examination of the federal governments treatment of Native Americans in the West. Her findings shock the nation with proof that empty promises, broken treaties and brutality helped pave the way for white pioneers. 1883 - A group of clergyman, government officials and social reformers calling itself The Friends of the Indian meets in upstate New York to develop a strategy for bringing Native Americans into the mainstream of American life. Their decisions set the course for U.S. policy toward Native Americans over the next generation and result in the near destruction of Native American culture. 1906 - A devastating earthquake virtually destroys San Francisco, setting off fires that burn out eight square miles in the city, leaving 250,000 homeless. Lost in the fire was the original flag from the "Bear Flag Revolt". Blomquist, L.R., A Regional Study of the Changes in Life and Institutions in the San Luis Obispo District, 1830-1850 (M.A. thesis, History Department, University of California, Berkeley, 1943). Breschini, G.S., T. Haversat, and R.P. Hampson, A Cultural Resources Overview of the Coast and Coast-Valley Study Areas [California] (Coyote Press, Salinas, CA, 1983). Cook, Sherburne F., Colonial Expeditions to the Interior of California: Central Valley, 1800-1820 (University of California Anthropological Records 16(6), 1960). Cook, Sherburne F., Expeditions to the Interior of California: Central Valley, 1820-1840 (University of California Anthropological Records 20(5), 1962). Osio, Antonio Maria, The History of Alta California: A Memoir of Mexican California (translated by R.M. Beebe and R.M. Senkewicz. University of Wisconsin Press, Madison, WI, 1996). The California Mission Site. Ed. The Civic Group. 24 Sept. 1998.